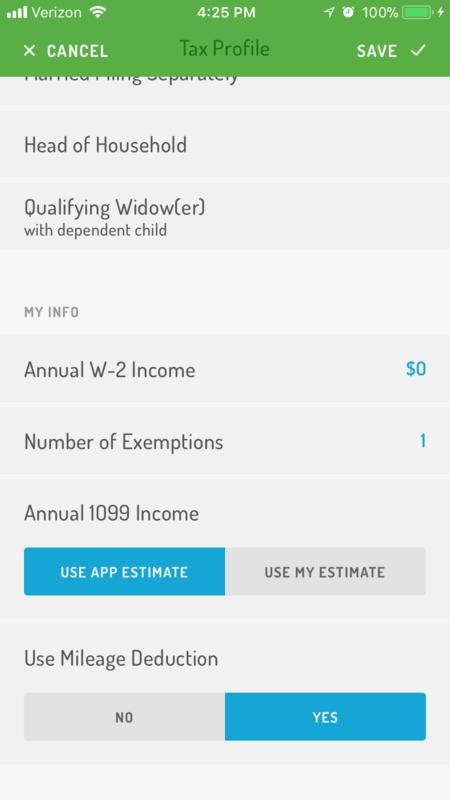 By navigating to the Taxes screen and tapping on Tax Settings, you can toggle on or off "Use Mileage Deduction", that way you can see whether you’re better off using the mileage deduction versus using vehicle expenses at any point in time. If you use a vehicle for business you may be eligible to deduct your auto expenses based on how many business miles you drove. In 2018 you can deduct $0.58 for each business mile you drive (the rate increased slightly from $0.545 per mile in 2018). The standard mileage deduction is available for self-employed individuals and drivers who use their car for hire, such as taxi or Uber. It is also available for individuals using their vehicle for a job-related move, charity, or medical purposes, although these activities are deductible at different rates. If you want to take advantage of this deduction, you'll need to track your miles. You should also know that there are a few circumstances that can prohibit you from deducting your miles, however you may still be able to deduct your vehicle expenses based on actual expenses. Refer to our diagrams to find out if the standard mileage deduction is right for you. Know what trips count. If you are using the mileage deduction, you can count trips from your home or your office to a temporary work-site or business meeting. However, the miles you drive getting from your home to your office are off the table. Know your limits. Outside of disallowed trips, there are a few other circumstances that can prohibit you from deducting your miles: depreciating your vehicle, taking a Section 179 deduction on your car, and applying the mileage deduction to more than five vehicles operating at the same time are all prohibited it you want to use the standard mileage rate. Generally, if you are taking the standard mileage deduction you are not eligible to deduct any actual expenses (depreciation, insurance, gas, maintenance and repairs, etc.) since all of these costs are already baked into the federal rate. However, you may be able to deduct your parking fees, AAA membership and tolls (to the extent these costs relate to your business activities) in addition to your business miles. If you use a vehicle for business you may be eligible to deduct your auto expenses. While many opt to take the standard mileage deduction, you also may have the option to deduct your actual vehicle expenses. To use the actual expense method, keep track of what you spend during the year to operate your vehicle, including gas, tires, insurance, license, registration and repairs, to name a few, and then deduct the portion attributable to your business driving. The actual method will require more record keeping than the standard mileage deduction, but it may be worth it -- you may could come out ahead at the end of the year. If you lease your vehicle you may include the portion of your lease payment attributable to your business driving as an actual expense. Drivers who own their vehicles may not include note payments as a part of actual expenses, rather, they will take a separate depreciation deduction. If you used the actual expense method the first year you placed your car in service, you cannot switch to the standard mileage deduction. Tickets and fines are not eligible for tax deduction in any circumstance.